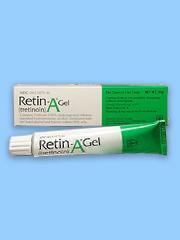 The Retin-A and Avita brands of tretinoin are used to treat acne. The Renova brand of tretinoin is used to reduce the appearance of fine wrinkles and mottled skin discoloration, and to make rough facial skin feel smoother. Avoid exposure to sunlight or artificial UV rays (sunlamps or tanning beds). Tretinoin topical can make your skin more sensitive to sunlight and sunburn may result. Use a sunscreen (minimum SPF 15) and wear protective clothing if you must be out in the sun. Avoid getting this medication in your eyes, mouth, and nose, or on your lips. If it does get into any of these areas, wash with water. Do not use tretinoin topical on sunburned, windburned, dry, chapped, irritated, or broken skin. Also avoid using this medication in wounds or on areas of eczema. Wait until these conditions have healed before using tretinoin topical. Use this medication for as many days as it has been prescribed for you even if you think it is not working. It may take weeks or months of use before you notice improvement in your skin. If you are using tretinoin topical to treat acne, your condition may get slightly worse for a short time when you first start using the medication. Call your doctor if skin irritation becomes severe or if your acne does not improve within 8 to 12 weeks. What should I discuss with my healthcare provider before using Retin-A (tretinoin topical)? FDA pregnancy category C. It is not known whether tretinoin topical is harmful to an unborn baby. Before taking this medication, tell your doctor if you are pregnant or plan to become pregnant during treatment. Tretinoin topical can pass into breast milk and may harm a nursing baby. Do not use this medication without telling your doctor if you are breast-feeding a baby. How should I use Retin-A (tretinoin topical)? Use tretinoin topical exactly as your doctor has prescribed it for you. Using more medicine or applying it more often than prescribed will not make it work any faster, and may increase side effects. Do not use this medication for longer than your doctor has prescribed. Wash your hands before and after applying tretinoin topical. Before applying, clean and dry the skin area to be treated. Applying tretinoin topical to wet skin may cause skin irritation. If you use Renova, wait at least 20 minutes after washing your face before applying a thin layer of the medication. Do not wash the treated area for at least 1 hour after applying tretinoin topical. Avoid the use of other skin products on the treated area for at least 1 hour following application of tretinoin topical. Applying an excessive amount of tretinoin gel may result in "pilling" of the medication. If this occurs, use a thinner layer of gel with the next application. Use this medication for as many days as it has been prescribed for you even if you think it is not working. It may take weeks or months of use before you notice improvement in your skin. If you are using tretinoin topical to treat acne, your condition may get slightly worse for a short time when you first start using the medication. Call your doctor if skin irritation becomes severe or if your acne does not improve within 8 to 12 weeks. Store tretinoin topical at room temperature away from moisture and heat. The gel formulations of Retin-A are flammable, keep them away from open flame. Use the medication as soon as you remember. If it is almost time for the next dose, skip the missed dose and wait until your next regularly scheduled dose. Do not apply extra medicine to make up the missed dose. Seek emergency medical attention if you think you have used too much of this medicine. Tretinoin topical is not expected to cause overdose symptoms. What should I avoid while using Retin-A (tretinoin topical)? Avoid exposure to sunlight or artificial UV rays (sunlamps or tanning beds). Tretinoin topical can make your skin more sensitive to sunlight and sunburn may result. Use a sunscreen (minimum SPF 15) and wear protective clothing if you must be out in the sun. Avoid getting this medication in your eyes, mouth, and nose, or on your lips. If it does get into any of these areas, wash with water. Do not use tretinoin topical on skin that is sunburned, windburned, dry, chapped, or irritated. Also avoid using this medication in wounds or on areas of eczema. Wait until these conditions have healed before using tretinoin topical. Avoid using skin products that can cause irritation, such as harsh soaps, shampoos, or skin cleansers, hair coloring or permanent chemicals, hair removers or waxes, or skin products with alcohol, spices, astringents, or lime. Do not use other medication skin products unless your doctor has told you to. Stop using this medication and get emergency medical help if you have any of these signs of an allergic reaction: hives; difficulty breathing; swelling of your face, lips, tongue, or throat. Less serious side effects may include burning, warmth, stinging, tingling, itching, redness, swelling, dryness, peeling, irritation, or discolored skin. What other drugs will affect Retin-A (tretinoin topical)? chlorpromazine (Thorazine), prochlorperazine (Compazine), fluphenazine (Permitil, Prolixin), promethazine (Phenergan, Promethegan), perphenazine (Trilafon), and others. This list is not complete and there may be other drugs that can affect tretinoin topical. Tell your doctor about all the prescription and over-the-counter medications you use. This includes vitamins, minerals, herbal products, and drugs prescribed by other doctors. Do not start using a new medication without telling your doctor.